Cassie Winslow: Hi, I'm Cassie Winslow, and my book is Floral Libations. Suzy Chase: What got you thinking about incorporating the unique flavors of flowers in beverages? Cassie Winslow: Well, I actually started experimenting with flowers when, years ago, when I was making homemade bath salts. And I realized, I'm using organic lavender and rose, and I'm putting in salt or sugar, and this I could use this as a culinary ingredient. And so, I actually started using it in cooking first, and then started experimenting with simple syrups and adding it, adding flowers that way to drinks, so yeah. Suzy Chase: So where do we start when we wanna stock our pantry with floral goodies? Cassie Winslow: I would say rose salt would be the most versatile thing to make. And the way that my book is laid out, is the first chapter is all about floral pantry. So the two main go-to's I would say would be the rose salt and the lavender sugar. They're both super easy to make, you just blend up the lavender, blend up the rose, and add it to either salt or sugar. And you can use it in cooking, you can use it like I said, making a bath salt, and then you can also make a really nice, simple syrup with the lavender sugar, and you can add it to any drink that you like, whether it's an iced coffee or a cocktail. And then the rose salt's really nice to use to rim glasses for favorite drinks, like Greyhound, or a margarita, of course, a Paloma. And I also like using the rose salt a lot in my cooking. The first time I actually ever used it was, I was making homemade french fries. And I seasoned the french fries with the rose salt, and they were the prettiest fries I've ever had. And they were delicious, too. Suzy Chase: What did it taste like? Cassie Winslow: Well it depends what rose you're using, but it adds a little tanginess to it. It's not really ... Rose isn't the sweetest flower. It can be, I guess, but most of the time, when I'm using rose, it just adds a little tanginess, a little bite to whatever you're using it for. But yeah, try it on french fries, it's a lot of fun. Suzy Chase: How long can we store the salts and the sugars that are in the cookbook? Cassie Winslow: I would say about six months. I've made big batches of the rose salt, and I've had it last for a year, honestly. But just to be on the safe side, I would say about six months. The sugar sometimes, depending on the flower, the bloom that you use in the sugar, it can add a little bit of moisture to the sugar, so it doesn't last as long. The shelf life is a little shorter than with the salt. Suzy Chase: 41 fragrant drinks are in Floral Libations. This book is way more than just dropping an edible flower into a drink. What are some different ways we can incorporate floral flavors into recipes? Other than french fries. Cassie Winslow: Well it's funny that you mention just adding an edible flower, because a lot of times, that's really a good way to incorporate eating flowers more often is just experimenting and tossing them into a salad. Nasturtiums grow crazy in Santa Cruz where I live, and we always have them year round in our yard, and I love just going out and gathering some, throwing them in a salad, and it just adds this beautiful brightness to the dish. And each Nasturtium, each color, tastes totally different. So it's just so much fun to just try something new. If you've never really tasted flowers before, it's fun to just try them. Go to the bulk section of your natural food store and get a little camomile, get a little calendula, and rose, lavender, and just taste them and see what you think, and if you like it. And if you like it, the lavender the most, then you can try experimenting with that. And if it's challenging to find dried flowers at your local natural food store, you can find them online. Or also if you look at the ingredient list, a lot of different teas are just whole flowers. I mention that in the book, too, with a lot of the recipes, like for the camomile syrup, you can just add a tea bag if you can't find camomile flowers in bulk. Suzy Chase: So I know safety is a huge factor in foraging and sourcing. What should we look for on the packaging when we're trying to buy safe, edible flowers? Other than, "Organic." Is there anything else we should watch out for? Cassie Winslow: Yeah, it needs to be organic, and definitely if you're going to use fresh flowers, grow them yourself. It's so easy to just toss some seeds out if you have a little bit of space in your yard. Or you can, I have a whole chapter on growing edible flowers yourself. You could do a little lavender and a little pot, and put it by your front door. And you know what you're putting into the soil. You know that you're not putting pesticides and using pesticides and that sort of thing. So I think grow them yourself, or go to the farmer's market. Growing them yourself is the safest way to go, though, because you know what you're using. Suzy Chase: In the book, you talk about dried versus fresh. What's the difference and what do you prefer? Cassie Winslow: I prefer ... That's a good question, because you can use them for different things. Definitely for fresh flowers, using them as a garnish is really nice, and also like I said, using them in salads and that sort of thing is really lovely. The thing that I like most about the dried flowers is they're easy to get your hands on. Like I said, you can find them in little tea packets or you could even find them online, too, they're really easy to come by. And the flavor is more concentrated. So for example, the rose petal sugar recipe that I have in the book, you can make it two different ways. One way, I use dried roses, and you just blend up the dried roses and then mix it with the sugar. Or another way that I can infuse some sugar using roses is I will grab a handful of fresh rose petals, and then let them sit in sugar for a week, and just mix them every day, and it is a more gentle flavor, I would say, than the dried rose. It's just more subtle. So it depends what you like. If you really like that bright, floral concentrated flavor, then dried flowers are going to be your friend. If you just wanna start slowly, then I would say try with fresh flowers and just add them as a garnish, and just taste. Taste and experiment. Suzy Chase: By the way, the photos in this book look like still-life paintings. Cassie Winslow: I really love the way that it turned out. Joan did an amazing job. It really is a love song to flowers in the way she captured the drinks in such a lovely, unique way. Suzy Chase: Was this your vision? Talk a bit about the design aspect of the book. Cassie Winslow: Yeah, when we were talking about, when I was talking to my editor about what I wanted the book to look like, I wanted photos, photos, photos, for every single recipe, pretty much. And that's pretty much how it turned out. I'm such a visual person, that when I'm looking through a cookbook, it's so helpful to see what it looks like, rather than trying to envision it myself. And of course, the flowers, they're so beautiful, and they add so much color and life to the drinks that I just really wanted to be able to showcase that for each recipe. Suzy Chase: You have drinks for different occasions, like Mother's Day, which is coming up, Spring bridal showers, a kid's birthday party, or even a beach bonfire. What would you recommend for Mother's Day, out of your book? Cassie Winslow: Oh the lavender, the lavender gin lemonade is so delicious. And it's really easy to make. So I think that that could be a really good first go-to recipe. And everyone loves it. It's just a great crowd pleaser, and it's so pretty, too. I was just actually making it last week with someone, and we made the rose simple syrup, and then added the lemon juice to it, and it just turned this bright pink color, it's so pretty. That's a good one to make for your mama, for Mother's Day. Suzy Chase: And I bet you could make one non-alcoholic. I guess you could just take the gin out. Cassie Winslow: That's what's so great about it, yeah. You just don't add the gin, and it still has lavender in it, because you're making the lavender simple syrup. Suzy Chase: Tell me about your blog called, "Deco Tartelette." Cassie Winslow: Yes. Well, I started Deco Tartelette, I wanna say five months ago. Has it been that long? My goodness. My husband and I were living in the middle of the redwoods in the Santa Cruz mountains, and I just was needing a creative outlet, and I had never even heard of a blog before. And we were, at that time, thinking about moving to Paris. We ended up not moving to Paris, long story. We moved to Hollywood instead. But I had discovered this blog of Oh Happy Day, actually. She had lived in Paris and I thought, "This is so much fun! I would love to do something like this." So I started the blog, and I did some fashion stuff, and stuff like I mentioned, I was making some homemade bath salts and homemade body care stuff. [inaudible 00:09:56] and just started posting recipes that I was making. I think the first recipe I posted was a blackberry lavender crumble that Darling Magazine actually ended up featuring, and then I ended up collaborating with them quite a bit. But yeah, it's been a creative outlet for me and because I love flowers so much, I've always incorporated them into the blog somehow. So over the years, since becoming a mama and not really having as much extra time to go and do these elaborate fashion shoots. That has dissipated a little bit. We still try to incorporate that a little bit. When I say we, I mean my husband. My husband helps me with the blog. But yeah, it's really transformed into a focus on floral recipes, which has been a lot of fun. Suzy Chase: Okay, now to my segment called, "My Last Meal." What would you have for your last supper? No pressure. Cassie Winslow: Oh my goodness. Can I come up with two? Or does it have to be one? Suzy Chase: Yes, you could totally come up with two, sure. Cassie Winslow: Okay. Okay, so I would say my husband's Milanese is one of my favorite things in the world, with a yummy salad, with a big piece of garlic bread, covered with herbs and of course sprinkled with some rose salt. That would be one. And then the other, hamburger, french fries and a strawberry lavender milkshake. Suzy Chase: That sounds great. I'm so hungry, that sounds really good. Cassie Winslow: So my website is decotartelette.com, and you can find me on Instagram and Pinterest @decotartelette. Suzy Chase: Flowers don't belong just in the garden or a vase, but in imaginative libations, as well. Thanks so much, Cassie, for coming on Cookery by the Book Podcast. Cassie Winslow: Thank you, Suzy! This has been so much fun, it's great speaking with you. Outro: Follow Suzy Chase on Instagram, @cookerybythebook, and subscribe at cookerybythebook.com or in Apple Podcasts. 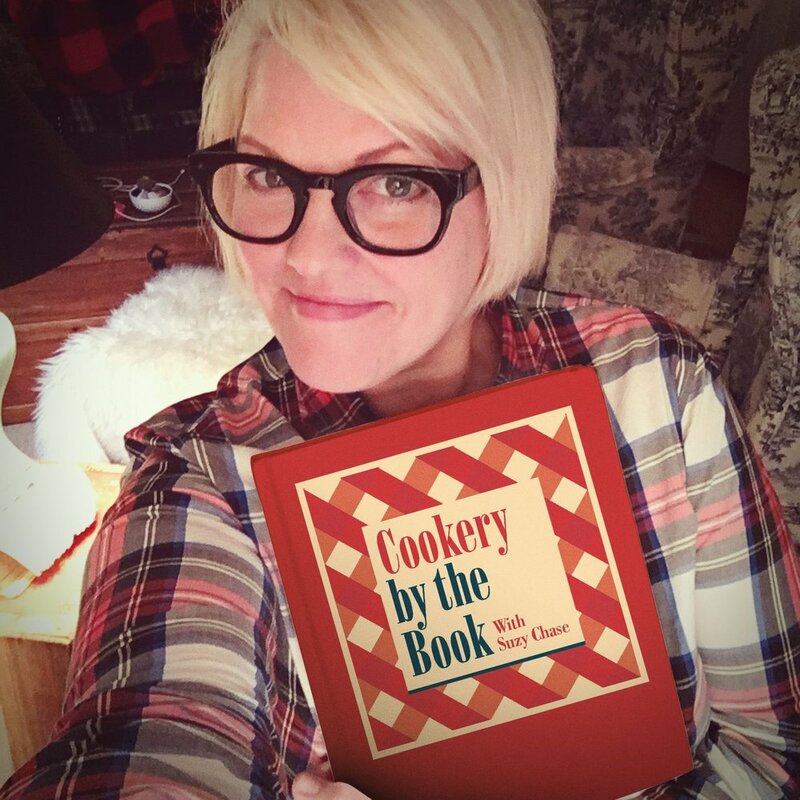 Thanks for listening to Cookery by the Book Podcast! The only podcast devoted to cookbooks, since 2015.